Hopefully everyone is back from the Christmas/New Years Holidays by now and already hit the deck running. I know we in the Manufacturing team are already off, well, most of us. I started the New Year by having cataract surgery. So I am going to combine some Healthcare with some Manufacturing in this blog. Consider yourself forewarned! First, what to expect from us this coming year: much more on the value of mobility and the ability to collaborate across the global workforce, wherever they are (yes, that is Borderless Networks); then a lot on the vast amount of data presenting itself to the factory and from the factory to the enterprise (you will hear the term “data deluge”); also the impact of “the cloud” on the factory; also the growing prevalence of tablets and other smart devices in manufacturing operations. And we will undoubtedly have new areas of concentration throughout the year as new technologies take hold in manufacturing. So, that is the preview of the year. But now I want to talk about my personal experience with Healthcare and how it relates to Manufacturing. 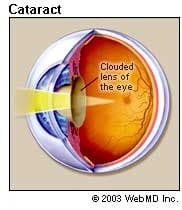 During one of my annual eye exams a couple years ago my Doctor indicated I had cataracts in both eyes. He at the time said it may have been due to protracted use of hard contact lenses earlier, or some other cause, like too long unprotected exposure to sun. Normally cataracts show up in elderly patients (and I am not yet one), but can show up for several reasons. Some hereditary, I will point out. A year later, I was seeing cloudy images (not to be confused with the cloud!) from one eye. I found that I was actually seeing 20/400 out of that eye. But my other eye was correcting me so I thought all was well. The eyes work wonders with the brain and they work together as a well tuned human system. Think of it this way: Input in, Process, Output out. Manufacturing systems work like our bodies, only our bodies do it perfectly. Without external programming. And yesterday I had cataract surgery. Regardless of what my Doctor or Pharmacist or neighbor said, regardless of what my Mom told me, I was nervous. I mean, it is my eye; a major input to my process, I see with it. And you know what? They spent 25 minutes prepping me for the surgery and it lasted little more than five minutes and I don’t remember a bit of it. I remember joking with the Anesthesiologist and then seeing blocks moving above my eye and then waking up in the recovery room. But a couple of closing thoughts: Healthcare depends on your definition of Healthcare. You get what you pay for. And proper Healthcare requires precise devices and tools that are manufactured to very strict requirements, to ensure the health and welfare of the patient. It requires educated Physicians that get continuing education on new technologies. It requires adoption of new technology when proven. So it is expensive. This will certainly continue to be a hot topic through 2012. But also, the ability to manufacture machines that build the precise components that require less than an eighth of an inch slit into my eye? And they put a new lens in there too! Through that same slit! That requires precise collaboration between the medical teams, the design teams, the surgical teams, the production teams and the delivery teams. It requires an equally exacting science and adoption of new technology and continuing education as well. This also will be a hot topic through 2012 and beyond. This is where Cisco leads the way: Open Active Collaboration – not just in Manufacturing, but in Manufacturing operations as part of an Ecosystem that includes Manufacturing, Healthcare, Education, plus our respective partners in Retail. Take advantage of the network – your future is there. nice information in that post. and gets a good information, i will skill wait to update to your blog as soon as possible. Hey Mark – glad to see the cataract surgery worked out! Looking forward to more from you in the new year, now that you’re seeing clearly, though you always seemed to see straight when it came to Industry Insights! Good point about the precision needed – I guess we’ll see even more improvements in the future, both in Health-care techniques and manufacturing precision. Good luck with your new eyes!